This is an acrylic triple slot brochure holder. With three slots you are able to display multiple brochures within the same display. 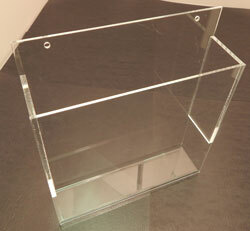 The clear acrylic construction allows for this holder to blend well in any retail environment. With the wall mount design you can place this brochure holder in any available wall space that you see fit. We carry versions to support 4” x 9” or 8.5” x 11” brochure sizes. Making sure information is made conveniently available for your customers is crucial for any retail store and this acrylic brochure holder makes that a much simpler task to handle. Acrylic wall mount brochure holder with double slot. Available for brochure sizes 4"w x 9"h, or 8 1/2"w x 11"h. Clear acrylic construction is highly durable and gives a clean professional look.